All LEUSD schools and district offices will participate in this statewide earthquake preparedness event. On Thursday, October 18, at 10:18 a.m., all LEUSD schools and district offices will participate in the Great California ShakeOut event. The Great California ShakeOut is an annual opportunity to practice how to be safer during big earthquakes. Participants will perform a drop, cover, hold on exercise, followed by a planned evacuation drill and communications & radio test of LEUSD's disaster preparedness procedures. 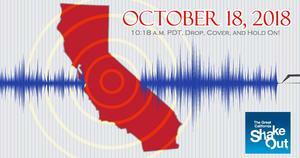 Visit the official Great California ShakeOut Website by clicking the link below.